These updates are designed for those customers wanting more control and stability on a variety of terrains, which are achieved by wider track spacing and a hydraulic management system. 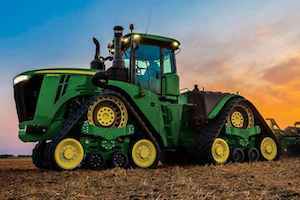 John Deere has announced that it is making several updates to its model year 2019 lineup of 9R, 9RT, and 9RX Tractors. The company will begin offering a 120-inch track spacing option on the 9470RX, 9520RX, 9570RX and 9620RX Series Four Track Ag Tractors equipped with 30- and 36-inch tracks. "The extra wide stance of this machine is ideal for customers wanting to control traffic patterns and enhanced stability on hilly terrain," said Tiffany Turner, product marketing manager of large tractors for John Deere. "A wider stance also makes it easier to perform daily maintenance and service plus it offers hassle-free material cleanout." Those who require a John Deere 9RX equipped with a 3-point hitch must select the 87-inch track spacing option with the 30-inch tracks. The wider 120-inch track spacing is not compatible with the 3-point hitch. In addition to the extra spacing, Deere is also offering the Hydraulic Intelligent Power Management system to customers. "Hydraulic IPM is specifically designed for air seeding operators using large drills and air carts on their farms," Turner says. "Hydraulic IPM provides an extra 25 horsepower in gears 5 thru 18 and adds 50 more horsepower in gears 1 thru 4, enabling the tractor to pull heavy loads through tough conditions." The CommandCenter AutoTrac activation also comes with the MY 2019 update. "AutoTrac guidance is included in base equipment on these tractors. AutoTrac has been shown to reduce operator fatigue, save fuel by reducing overlap, and help you work more acres in less time," Turner says. More information on all of these updates can be found by speaking to your local John Deere dealer or visiting JohnDeere.com/ag.